The agricultural development project, Peru Cacao Alliance (PCA), has contributed to climate change mitigation. Estimated carbon sequestration from perennial crop expansion, which was –211,467 tCO2e metric tonnes of carbon dioxide equivalent per year, more than offset increased greenhouse gas emission (GHG) from fertilizer and pesticide management (10,286 tCO2e). The net difference, –201,180 tCO2e, is equivalent to the carbon content of 465,774 barrels of oil.  The agroforestry system promoted by PCA included cacao and shade trees. Since PCA could not provide definitive data detailing the presence of existing shade trees compared to the planting of new shade trees, this analysis did not include carbon dynamics of shade trees. If new trees were planted for shade, there would be greater carbon uptake by the system than presented in this analysis.  PCA reduced emissions intensity for cacao (CO2e emitted per kg production) through improved carbon sequestration and increased yields. PCA improved cacao postharvest handling (proper pod selection, storage, drying and fermentation methods) by building knowledge and capacity in producer organizations. Nash J, Grewer U, Bockel L, Galford G, Pirolli G, White J. 2016. 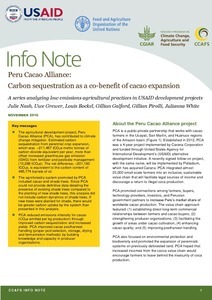 Peru Cacao Alliance: Carbon sequestration as a co-benefit of cacao expansion. CCAFS Info Note. Copenhagen, Denmark: International Center for Tropical Agriculture (CIAT) and the Food and Agriculture Organization of the United Nations (FAO).